The push for end of year sales is upon us. Are you on track to meet your end of year sales goals? I was a college football coach for 10 years. In that time, I discovered principles for winning, even when it meant coming from behind to clinch the win in the last few seconds. Surprisingly, I have been able to apply this same mindset to achieving end of year sales goals. Many large corporations focus heavily upon fourth quarter returns. However, we have found that entrepreneurs and sole-preneurs often struggle most at the end of the year. Holidays, special events, and children’s activities often derail the original business plan and can destroy momentum. The end result is missing goals set for the current year and seriously damage productivity in the new year. How to get the most out of the days remaining in the fourth quarter starts with assessing where you are. Starting on October 1 there are 92 days till December 31. However, subtracting weekends, Columbus Day, Veterans Day, two days for Thanksgiving, and five days at the end of the year, leaves only 57 actual work days. YIKES! The end of the year is heading toward us like a high speed train. Here are a few tips on how to get the most out of 57 days. Winning sports strategies that can help you reach your end of year sales goals. This past year’s Super Bowl saw the breath-taking win of the Philadelphia Eagles over the New England Patriots. Pulling off such an upset required intensity, focus, and following a solid plan through the last second of the game. First look back. Have you accomplished all you set out to do in January this past year? Are you on track, ahead of schedule, or somewhat distracted and trying to catch up? Perhaps your original plan was flawed and needs a bit of tweaking. What must you do to keep moving ahead? The trick play Philadelphia called was key to winning the game. What have you got up your sleeve? Has anything gotten in your way and prevented you from achieving your goals? Are there things that have prevented you from maximizing your productivity? If so, can you list them? We have little control over illness, tragedy, and family issues. However, there are other, more subtle issues that are equally devastating to business and career success. Fortunately, these we can remedy. It’s easy to get off track when you allow ‘the tail to wag the dog.’ This tends to happen more often to those who have not identified clear goals and set a daily activity plan for attaining them. Remember, saying yes to one thing or person means you are saying no to something or someone else. If you are determined to reach the goals you have set you are going to need to dig deep and find the strength to tell people in your life, “NO!” You can’t be head of the holiday planning committee, engage in extra-long lunches, or slip out early on Fridays to finish holiday shopping. Instead, practice saying “YES” to your business plan, the goals you set at the beginning of the year, and increasing your book of business. 2. Business activity being controlled by your emotions rather than your plan. It amazes me how many individuals work only when they feel like it. They only go to their networking events when it happens to be convenient. Picking up the phone to book sales appointments takes place when they are ‘in the right mood’. Receiving a negative response from a prospective client ruins their week. Become more robotic in your energy. Engage in activity regardless of results. Develop the self-discipline to be motivated by the mission, not disappointments during the journey. Remember, NO leads = NO business. An empty appointment calendar is the most glaring indicator of an ineffective system for following up leads. By ‘appointments’ I’m not talking about the ‘getting to know you meeting over coffee’. This type of meeting may eventually lead to new business but it rarely results in an immediate purchase. Remember, we’re focused on end of year sales goals, for this year. The type of meetings that will help you now are actual sales presentation meetings. In addition, if you want to generate a consistent flow of business, you will need to do 20 sales presentations per month, every month. The most effective and time efficient method for booking appointments is through phone contact. Each of as has faced fear in some form. Everything I’ve read and personally experienced has proven to me that action conquers fear. Fear comes from lack of action. When we started out in business 30 years ago, we were scared. We had no knowledge of how to be in business. No one looked at us an thought we could be successful. We did not believe we could be successful either. We had a lot of doubt. Fortunately, at a business conference we heard John Terhune say, “If you do what successful people have done, you’ll have what they have.” Simple. Therefore, we identified those who were successful. Then we began to execute the activities that these successful people were doing. The rest is history. Perhaps you like motivational and self-help books. We do too. However, the challenge in reading them is putting their suggestions into action. Rick Pitino’s book, “Success is a Choice” explains why even the best of these books can cause our confidence to falter. According to him, great books and training help us to identify what needs to be done to be successful. Once your brain understands this you need to apply what you’ve learned. If you don’t, your subconscious will tell you that because you don’t do, you cannot succeed. Hence, your self-confidence falters. The number one way to build self-confidence is to win at the little things. We always have a strong finish to our year because we treat Oct-Dec with the same energy, optimism, and work ethic as we do our first quarter. We have a razor sharp focus on our goals and are relentless in achieving them. Because we work ’till the ball drops on New Year’s Eve’, we have many sales appointments and trainings on our calendar for January – March. Unfortunately, business owners who are functioning at only half speed Thanksgiving through New Years often do not meet their end of year sales goals. More importantly, they have little in the works for the new year. A slow start to the new year can result in a slow first quarter. This results in playing ‘catch up’ for the rest of the year. What are your end of year sales goals for 2018? How many days are you going to work? How many hours will you be working each day? Learn to say “NO” to any activity that conflicts with your goals. Generate leads – go through collected business cards, CRM, use LinkedIn for lead generation. Create a sales presentation prospect list. Call those on your list. Set up sales appointments with prospective buyers. – You goal is no fewer than 20 per month. Follow up with prospective buyers. Work to book appointments for the new year. Book a FREE 15-minute consultation with Joe to help you stay on track and meet your end of year sales goals. 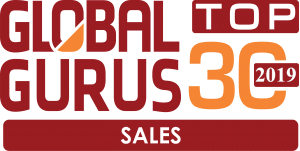 Joe Pici has been ranked in the TOP 30 Sales trainers internationally by Global Gurus.